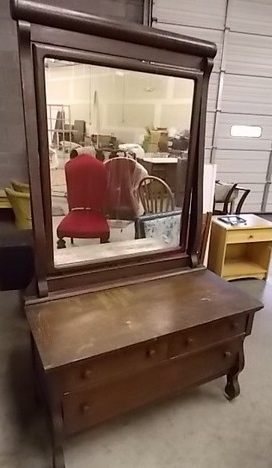 I have fun wondering about the past lives of the furniture we pick up, especially pieces as old as this antique Empire-style dresser and mirror set that we believe dates to the 1890’s. In 1896, the first modern Olympic games were held in Athens, Greece, Henry Ford took his “Ford Quadricycle” for its first spin around Detroit, and William McKinley defeated William Jennings Bryan in a heated race to become the 25th President of the United States amid the backdrop of a crippling economic depression. That was a pretty big year! It was also the year that heralded the births of comedian George Burns, writer F. Scott Fitzgerald, and First Lady Mamie Eisenhower. 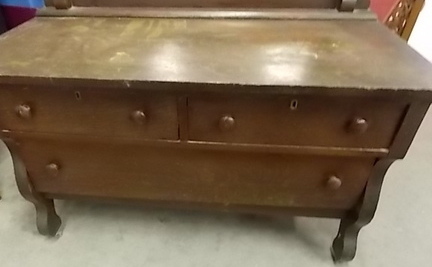 Unfortunately, I don’t know much about the history of our dresser and mirror set, but I do know it has sturdy bones and fabulous curves. Based on the condition of the finish when we found it, I would say it has lived a full life! 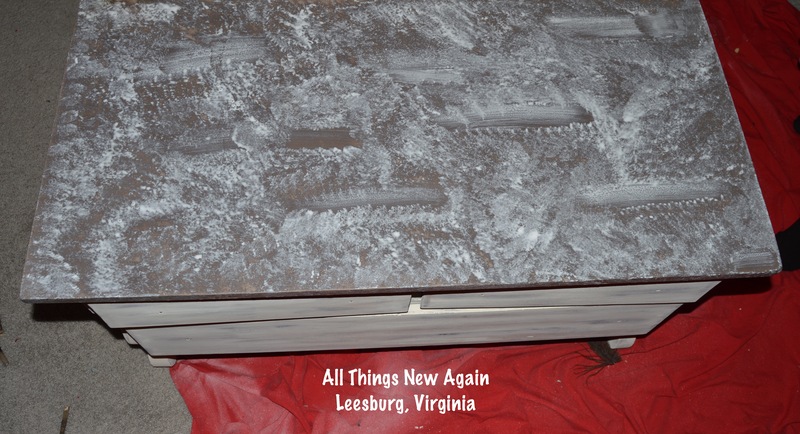 I started by sanding the top of the dresser because the veneer on it was so rough. I wanted a smooth surface for painting. 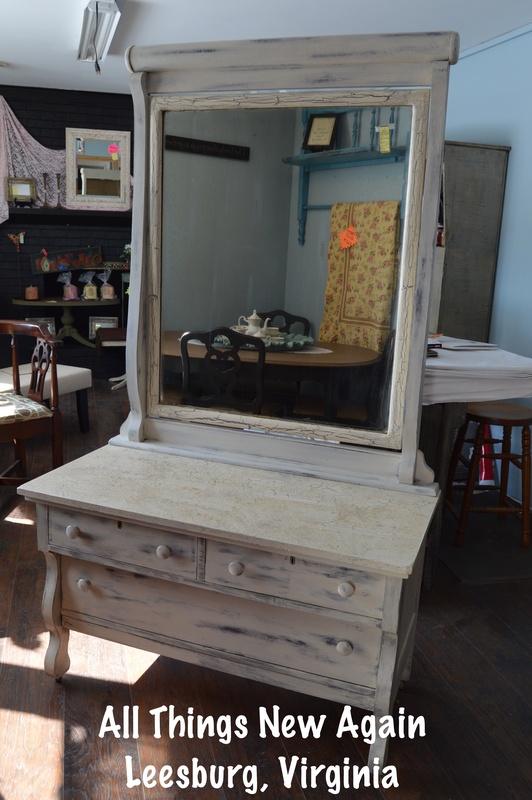 When the entire area felt smooth, I base coated both the dresser and the mirror with a neutral taupe color. As the paint was drying, a spot appeared on the top of the dresser where I had sanded. At first I thought it was a little splotch of “bleed through”, an area where parts of the wood or old finish seep through the new paint. Bleed- through is annoying, but easy to fix by covering the stain with a primer then re-painting. However, on closer inspection, I realized this wasn’t a stain. It was a raised area of wood where it had been smooth earlier. The history of this piece isn’t the only mystery. I’m not sure what happened to cause this one area to bubble up like that, but I did not want to sand everything down a second time, repaint it and risk the bump coming back. 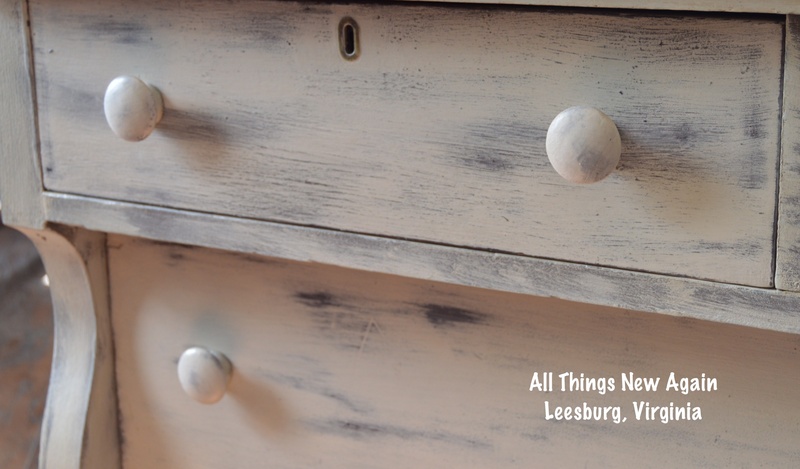 Instead, I came up a new plan to camouflage the spot by intentionally adding texture to the dresser top with a technique called crackling. I stuck with my original plan for the body of the dresser, the drawers and the mirror’s frame. I painted a creamy white over the taupe then “wet distressed” by rubbing a damp cloth over everything to reveal the taupe underneath. 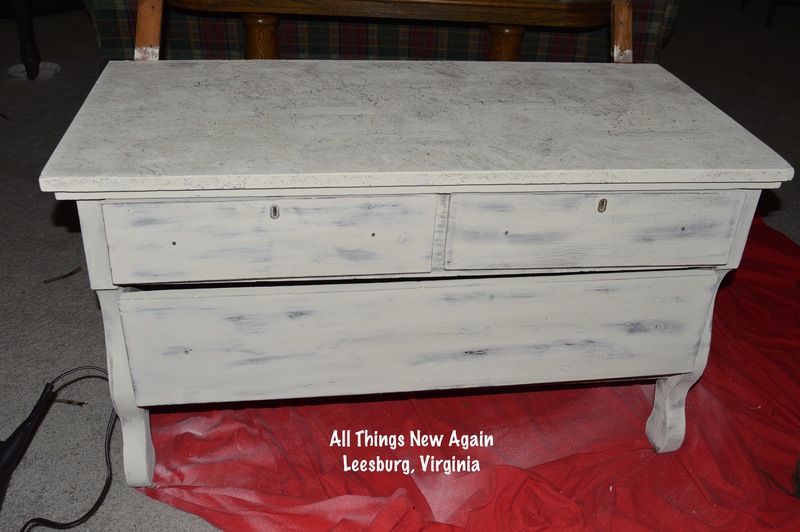 After the dresser’s base was complete, I went back and crackled the top. To crackle, bascoat your piece with the color you want your cracks to be. 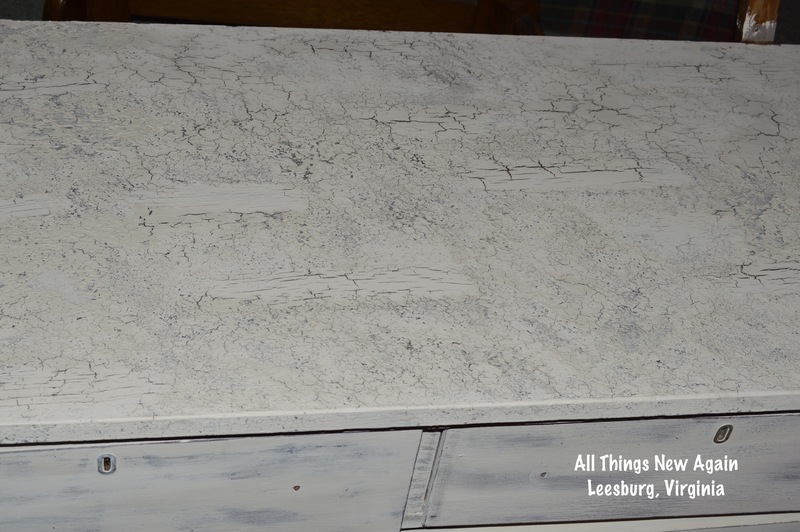 For this dresser top, the taupe color became the cracks. When the paint dries completely, apply glue. Yes, that’s right—the “secret crackle ingredient” is plain old white Elmer’s glue. When the glue is tacky to touch, you are ready to apply the second coat of color. This is where you have to be careful. If you brush on the paint too aggressively or go back and forth over an area too many times with your paint, you will disturb the glue underneath and you will get wimpy cracks. 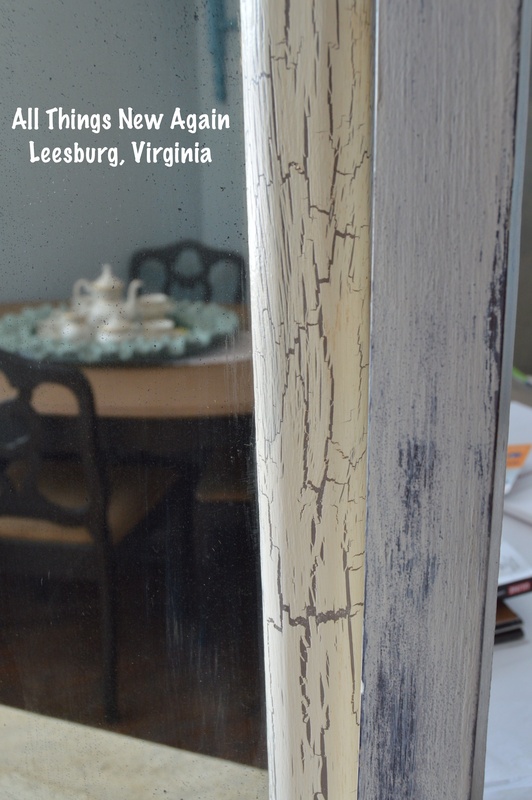 For the mirror, I distressed and clear waxed the larger frame to match the dresser drawers. I crackled and dark waxed the mirror’s frame to match the dresser top. Here is the finished set! Ready for its next 125 years! 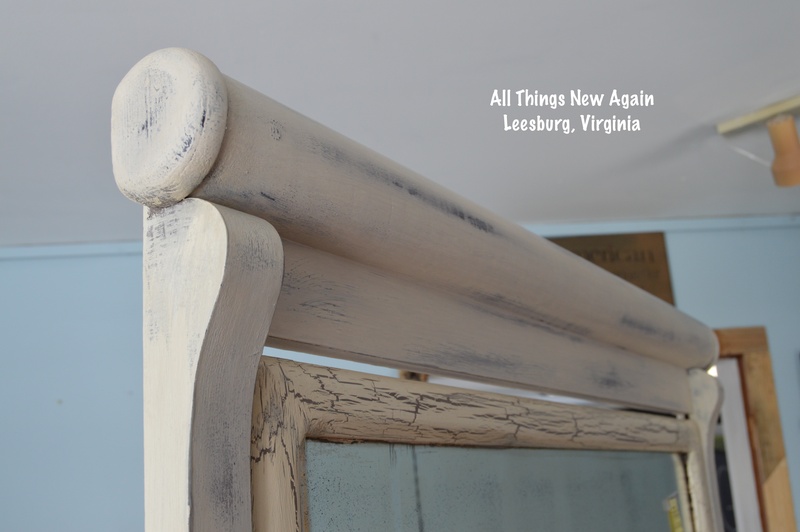 All Things New Again is a boutique furniture store and paint studio in Leesburg, Virginia.